Project Maier - malariaresearchhus Webseite! As a parasite that spends most of its life cycle inside host cells, the lipid metabolism of Plasmodium falciparum is of particular importance. Lipids are important as building blocks of parasite-derived membranes, for the modification of host membranes, for signalling events, and as energy storage. Mathematical modelling of lipid metabolism with the classical approaches such as stoichiometric networks and ordinary differential equation systems has not yet provided satisfactory insights, due to the complexity of lipid metabolism characterized by many different molecules with only slight differences and by promiscuous multifunctional enzymes. 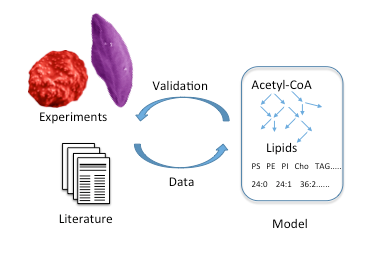 In this project, we will apply an object-oriented stochastic model approach that treats all precursor molecules and lipids as objects that can undergo the respective converting reactions. Its suitability has already been demonstrated for yeast lipid behaviour during progression through the cell cycle (Schützhold et al., submitted). This approach allows tracking of the dynamics of all lipid species with different fatty acids, different degrees of saturation and different head groups over time as well as the location-dependent distribution. Hence, lipid variation across different developmental stages and sexes, different organelles, or different host cells can be monitored. By analysing the effect of parameter changes, potential mutations in the catalysing enzymes or provision of different precursors the model will be able to deliver predictions about potential drug targets or mutation effects that can then be tested experimentally. Interlinkages: Andreas Herrmann (HUB), Alyssa Ingmundson (HUB), Kai Matuschewski (HUB), Frank Mockenhaupt (Charité), Simone Reber (HUB), Nishith Gupta (HUB), Melanie Rug (ANU), Kiaran Kirk (ANU), Giel van Dooren (ANU).